In years 7 and 8 young artists will learn how to depict their visual world through a wide variety of media and technique. The Key Stage 3 schemes of work are designed to allow breadth and depth of study across a range of art discipline. Our young artists experience how it feels to work like an artist, designer and a maker, over the 2 years. The work of other artists, designers and makers are explored and our young artists learn to embrace work from the past, as well as current art practice. There are currently 2 GCSE Art based courses here at Didcot Girls' School, one is an unendorsed Art, Craft and Design course and the other is an endorsed Graphic Communication course. Both courses are examined by AQA and therefore use the same assessment criteria. Both courses provide students with opportunities to explore a variety of starting points and use processes and techniques which they may not have had access to at Key Stage 3 level. A typical unit of work will explore 4 assessment objectives by taking students on a creative journey, exploring other artists work and developing ideas and experimenting as their ideas develop. There are typically 2 coursework units and an exam unit, where students sit a 10-hour exam in which they produce their final outcome. This takes place around Easter time. We have several art rooms one of which is a ceramic room, housing 2 kilns and 2 potters' wheels. We have an art library and study area with 9 computers, high quality laser printer and scanners. We also have dedicated A-Level teaching spaces. All classrooms are equipped with cameras and projectors, and also visualisers which we use for 'real time' demonstrations. The school's Art Gallery displays exhibitions of work by students from across all year groups throughout the year. There is a specialist Graphics studio in St Frideswide's building with Apple Mac computers. Work here includes Graphic Design, Illustration Package Design and Photo Editing. Animation software is used alongside traditional processess and work often involves 2D and 3D artwork for use in design outcomes. All students have the opportunity to work after school on their GCSE coursework throughout the course and engage in any extra curricular competition entries that arise. Gallery visits are encouraged in KS4 and KS5. We run a bi-termly competition in our VIEW Gallery and all students are encouraged to enter their individual interpretations of the changing themes, throughout the year. Winners are announced in whole school assembly where they receive a prize gift. In Years 9, 10 and 11 at key stage 4, students can choose to follow AQA GCSE Dance where they extend their skills in choreography and performance and are introduced to dance appreciation. Within the sixth form, the department runs AS and A2 courses in Dance where the students follow the AQA specification. The students are introduced to studying a specific era of dance development as well as a specific dance genre. This is in addition to the above 3 main areas continuing to be studied at a higher level. At Didcot Girls' School we pride ourselves on delivering energetic, and educational Drama lessons where all students of various abilities can excel and make excellent progress in this subject. In Key stage 3 we offer a comprehensive study of Drama from various cultures styles and genres: ranging from Shakespeare to Commedia, Puppetry, Melodrama, Slapstick Clowning and scripted plays. Students in year 7 and 8 receive 1 hour a week of Drama and they can also attend a Drama club on a Thursday after school as well as getting involved in the fabulous Upper and Lower School shows. This GCSE is weighted towards the practical exam. Unit 2 is the written exam paper worth 40% which they sit in June in Year 11. All lessons are practical and style and form varies from term to term. Both these GCSE exams offer the students a chance to get involved in drama and dance work- shops as well as theatre trips which compound their learning further. Work that is learnt at KS4 lays the foundation for A Level Performing Arts. EDEXCEL Performing Arts is offered at both AS and A2. The A Level students follow a vocational pathway through the course which promotes a significant level of independent work. The students study 6 units of work over the two year course which encapsulates all elements of the performing arts industry and prepares them for work in that industry or drama collage pathways. The A Level is weighted towards the written element and students must be aware that 4 units of study involve students keeping detailed portfolios. Unit 7 Performing to a commission. During Music lessons at DGS, students will develop their musicianship through immersing themselves in a variety of styles of music. They will learn to perform and compose in these styles, but they will also study patterns, history, culture and context. In addition to these areas, students will also learn group skills and the importance of practice. All students will have the opportunity to perform on a number of instruments, including voice, and develop their skills as practical musicians. There are a number of extra-curricular opportunities for students to take part in Music, also. There are currently two choirs: one for Year 7 and 8 and one for the upper school. There is also an Orchestra which is open to all instrumentalists of any ability. Music lessons are available in school on a wide range of instruments and interested students should speak to Mr Dingley to find out more details. If you are interested in starting lessons on an instrument/voice, please fill in the form below and return to Mr Dingley. Students in Year 7 and 8 will study a range of styles from Classical to Popular, developing practical and ensemble skills. They will create their own music, learn how to perform the music of others and develop the critical skills necessary to make improvements to musical performances and compositions. Students follow the Edexcel GCSE Music course, in which the ability to understand the context and culture of a piece of music is essential. As part of the course, students must perform, compose and analyse music, meaning that GCSE Music has one of the greatest breadths of skills for the future. Music and Music Technology are taught in the sixth form in conjunction with St Birinus School. This year we have a new set of Music Ambassadors, helping out with different roles around the department. Further information about the ambassadors can be found outside F14. 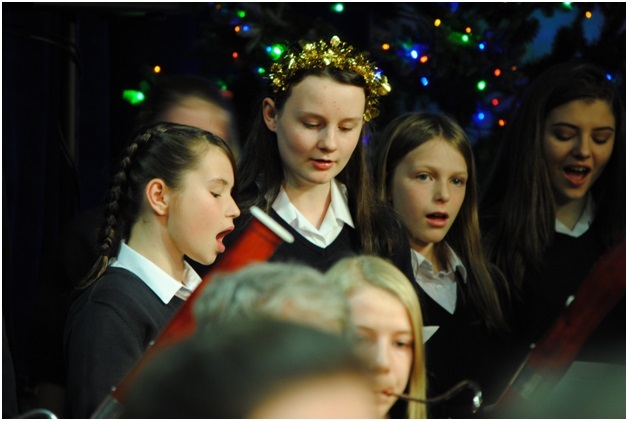 Last week, we had our Christmas Concert which was a big success. The concert included a range of pieces, from 120 members of Young Voices singing Moana, to Orchestra reminiscing about the snow days with White Christmas. Thank you to everyone involved! Our next concert will take place on 27th March 2018. Other upcoming events include a trip to see Wicked in London and the European Music Tour taking place this summer, which includes visiting Germany, Belgium and The Netherlands. We hope you all have a relaxing Christmas break!